One of my many home-made pieces of jewelry. Not a bad subject, but not real good for this challenge. I don't find this stunningly symmetrical. Not really well taken either. The focus is a fuzz off and it could be a little more exposed. needs focus, try a tripod, harsh strong light has given dark shadow which throws off the symetry a little! good job, the symetry pulls the picture together. 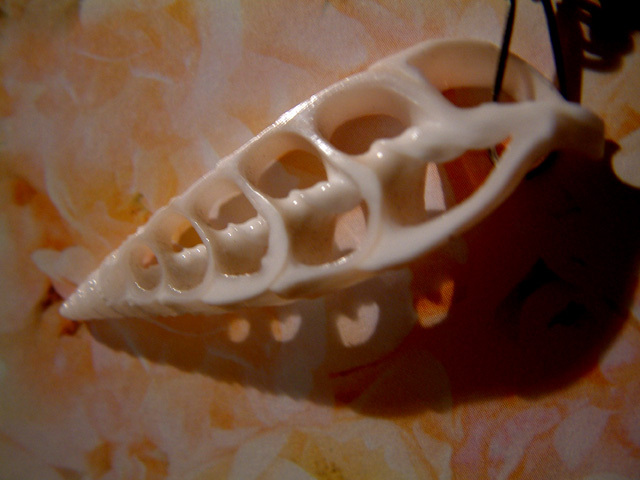 .....composition and shapes of shell pendant and shadow are interesting..... I would have tried a tighter crop and worked on fine focus. The soft pastel colours have great potential. It looks like you needed more light for this shot. Also, a background with more contrast (perhaps blue) would have highlighted the pendant rather than hide it. Good idea, I think it would benefit from stronger focus and more lighting. The background matches the colors, but it leads to an image with little contrast. I think the shell would look good resting in sand, and with the string taken out. It works as a seashell alone without the pendant part. The topic is met well here but the focus is alittle too soft. A sharper focus and this would be a really good shot. Proudly hosted by Sargasso Networks. Current Server Time: 04/24/2019 12:34:29 PM EDT.